She co-founded the Australian Home Staging Symposium and has been a speaker on national and international speaking engagements, including the Real Estate Staging Association National Conference in the USA. Recently, she was announced one of the ‘Top 5 Home Stagers in the World’ whilst in the USA. The author of the best-selling book, “Ignite Your Property Mojo”, Naomi’s wide-ranging research has produced an impressive list of publications. Naomi has received teaching excellence awards from the University of Newcastle and the Australian College of Education, and has been nominated for a national award with the Australian Teaching and Learning Council. An authority among industry leaders, Naomi has mentored experts and high profile personalities in the field of renovation, home staging and real estate. This has included design business owners Alisa and Lysandra Fraser, whom Naomi advised following their first appearance on The Nine Network’s The Block. Naomi quickly fell head-over-heels in love with renovating after cosmetically transforming her first house – which had such success at sale time – that it allowed her to greatly reduce her debt and to move on to her next property. For Naomi, renovating property was the answer to making money, to creating wealth and to financial freedom! Since starting, she has been actively involved in more than 110 renovation projects and currently works with around 200 homeowners each year to maximise the value of their properties for sale. Naomi helps provide the perfect place to start your journey making money through property renovation through her Rapid Renovation Formula™. Designed to give you a clear understanding of what a renovation is, why you should do it and how to do it successfully for wealth. Naomi helps provide the perfect place to start your journey making money through property renovation through her Rapid Renovation Formula™. Designed to give you a clear understanding of what a renovation is, why you should do it and how to do it successfully for wealth – the Rapid Renovation Formula™ reveals the 6 key elements to renovating for wealth – including how to find a project, planning and managing the renovation, connecting with the buyer and how to make more money on auction day; how to use ‘Space Medicine’ when planning your renovations; and why ‘Property Styling’ is so important to your renovation so you can maximise your profit. During the past decade, the media has become saturated with reality TV shows and lifestyle programs, which have highlighted the financial potential, fulfillment and life-changing adventure that can be found in renovating for wealth. But renovating is not an endeavour you should jump into boots and all without careful thought, research and planning. The good news is that you’re in the right place! And that’s if you want to renovate to create your perfect home, develop an asset to produce rental return, or increase its value to maximise your profit on sale day. 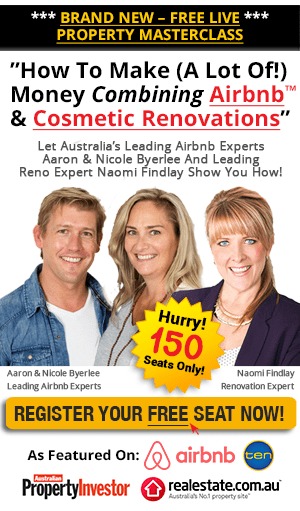 Naomi’s complimentary Live event is the ideal place to start your journey of making money through property renovation. Learn how to make ‘rapid’ money when renovating by clicking the button below.